The Ensemble Aedes was founded in 2005 by Mathieu Romano and is committed to performing the major works as well as the less known pieces of the choral repertoire of the five latest centuries, including contemporary creation. The Ensemble brings of seventeen to forty professional singers together. Its repertoire already includes lots of a cappella cycles, oratorios and staged operas, and several programmes for choir and piano, organ or instrumental ensemble. The Ensemble collaborates on a regular basis with well known ensembles such as Les Siècles (conductor François-Xavier Roth), le Cercle de l’Harmonie (conductor Jérémie Rhorer), Les Musiciens du Louvre Grenoble (conductor Marc Minkowski), the Orchestre Philharmonique de Radio France, the Latvian Radio Choir and the Maîtrise de Paris. The Ensemble Aedes is artist in residence at the Théâtre Impérial de Compiègne and at the Cité de la Voix de Vézelay. It has already performed in many prestigious theaters like the Philharmonie de Paris, Théâtre des Champs-Elysées, the Opéra Royal de Versailles, the Opéra de Bordeaux, at the Festivals of La Chaise-Dieu, of Besançon and at the Festival Radio France of Montpellier and Grenade and other French national scenes and festivals. Contemporary creation and 20th century’s music are essential to the ensemble’s repertoire. In 2008 it created a work commissioned to the composer Philippe Hersant. In 2011, it creates an oratorio foir choir composed by Thierry Machuel at the Festival of Clairvaux. In 2012, the Ensemble took part to the French creation of Brice Pauset’s Furcht und Zittern with the Orchestre Dijon Bourgogne. Works from Fénelon, Jonathan Harvey, Aurélien Dumont and Philip Lawson are part of its repertoire. Its first a cappella recording « Ludus Verbalis » dedicated to secular music of the 20th century was released for the label Eloquentia (Harmonia Mundi distribution) in June 2011 and was awarded a Diapason découverte and an award from the deutsche Schallplattenkritik. 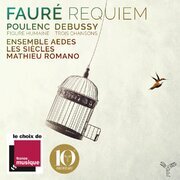 The second volume was released in November 2012 and was awarded a Diapason d’Or. In September 2013 « Instants Limites » was released (Aeon / Harmonia Mundi), this record was dedicated to the composer Philippe Hersant and awarded a Diapason d’Or. The double recording « Ludus Verbalis Volume 3 and 4 » dedicated to sacred music of the 20th century was released in April 2015 for the label NoMadMusic. 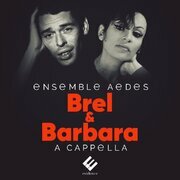 In December 2018, releases by Evidence Classics, an album of 17 a cappella songs by Jacques Brel & Barbara was rearranged specially for the Ensemble Aedes. On March 1st, 2019, the last album of Aedes Ensemble was released, which presented Fauré's Requiem and Francis Poulenc's Cantate Figure Humaine. In June 2016, Ensemble Aedes is nominated Musical revelation of the season by the Association Professionnelle de la Critique Théâtre Musique et Danse. The Ensemble Aedes is artist in residence in Burgundy and Picardy. It develops a real parallel season dedicated to education and community as important as its concerts season. The Ensemble is committed to educational projects for high school students, as well as for singers and conductors, amateurs or young professionals. Deeply committed to sharing music everywhere and with everyone the Ensemble Aedes is willing to promote music in isolated areas such as hospitals and prisons.